L’Infiorata – An amazing flower festival.. With a twist! 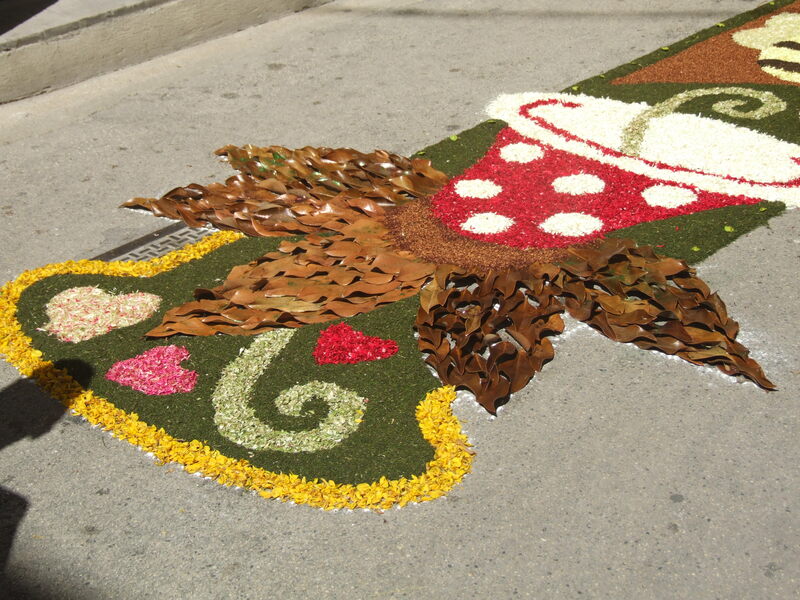 The community effort of the Infiorata in Cannara is truly something special to see! We were introduced to the Infiorata back in 2002 when we were in our campervan and staying by lake Trasimeno. A fellow camperisti told us that we simply MUST see the flowers and that there would be a very large ‘Raduno’ of camper vans there (camper rally) With our vague grasp of Italian we were amazed to even understand WHERE this event would take place – let alone what it was….We arrived at the Sports Centre in Cannara and managed to shoehorn ourselves into the last available space – there were hundreds of camper vans! We’d been told the festival was on the Sunday, but we missed the important detail of when & didn’t realise it was specific…. So, we sauntered into town after our lunch at about 3pm, and of course, everything was long over with the remains of the gorgeous designs still visible but the wind had scattered the flower petals in all directions. Oops! We vowed to get it right the next year, this looked too good to miss! So, over the years since then we’ve visited the Infiorata at both Cannara & Spello and seen displays in Perugia (Piazza IV Novembre), Assisi and Montefalco – they all had one huge religious design each in front of their churches. Assisi was a pretty event, they filled the fountain in the main Piazza with flowers – it looked beautiful. We’ve never had the stamina to see just how much work went into producing these stunning yet temporary designs. Last year we got a glimpse of the final part of the enormous effort the whole community goes to for the Infiorata. We wandered through the streets of Cannara on the Saturday evening just as the designs were being started then the following day we met with friends in Spello to view the amazing displays there. Undoubtedly beautiful – but – and this is necessarily a personal view – we feel it’s spoilt by the hoards and hoards of people descending on the little town making it very difficult to move about and almost impossible to see the designs! It’s not as crowded in Cannara, and we think it’s less commercial too. It’s a wondrous festival, certainly not unique in Italy, but each community makes an effort to create a unique event, year on year – one of the sights to see if you find yourselves in Italy at that time of year!